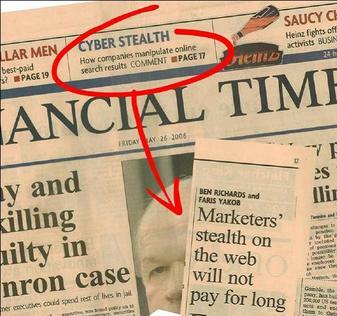 My mate Ben and I had an article in the Financial Times last Friday about 'cyberstealth' marketing techniques and the rise of the stealth consumer. I like the idea of stealth consumers - they seem the logical counterpoint to the escalation of marketing warfare, whether carpet bombing or guerilla - hiding from brands, empowering themselves with technology to make more informed decisions. UPDATE: You need a login for FT.com to read the whole thing online so I've posted an image of the whole article as a pdf here.